PC Headset Adapter for the Cisco 7940 IP phone enables the transformation of a standard computer headset with dual 3.5mm audio plugs to Cisco-compatible headset with RJ9 modular plug. These computer headsets are available in most computer stores, and have separate Speakerphone / Microphone plugs. This solution gives you great flexibility in choosing a headset you like. For example, you can use chat headset that you may already use with your computer. Or buy a gaming headset that will block most outside noise. Or choose between behind-the-neck and boom-style headset. As far as the headset has an individual Headphone & Microphone plugs, it is compatible with our adapter. And you still can use it with your computer or gaming console. Our headset adapters for Cisco Unified IP Phones enable you to use all the features that Cisco 7940 Unified IP Phone provides. You can respond to a call with either headset or handset and switch between them during the conversation. You can use Auto-Answer with headset or handset. For speaker phone, handset or headset, you can save volume settings separately. These adapters are also compatible with in - line hearing aid amplifiers. You can connect external desktop speakers and external microphones and use the standard Cisco 7940 phone as a conference station. You can connect a loud speaker for overhead announcements with Auto-Answer feature. 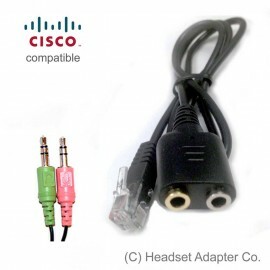 Adapter can be connected to the PC Sound Card to play messages, record calls, or even make automated calls through CTI Phone Control (audio level adjustment may be required). Plug it into the Headset port on the back of the phone to connect a headset adapter to the Cisco Unified IP Phone. After connecting the modular plug, attach the adapter cable to the phone and insert it into the cable management channel. Warning! Warning! Do not plug the headset adapter into the AUX port - it can damage your phone. Microphone plug (Red / Pink) to the RED headset adapter jack. If you need to switch from headset to handset, just pick a handset and the headset will be deactivated (headset button will be deactivated). Press the headset button to switch from the handset to the headset. Now you can put the handset in the cradle.